In 1873 a pair of immigrants, one a former paper hanger, the other a grocery clerk, opened a Chicago saloon they called “The Thistle,” emblem of their native Scotland. Within a few years they had planted their “thistles” all over town and owned the most elegant hotel in the Windy City. Their names were Alexander Donnon (A. D.) Hannah and David Hogg. Hannah was born in Wigtonshire, Scotland, in 1845, the son of Alexander and Mary (Patterson) Hannah. Educated in the public schools of Scotland, at the age of 23 he emigrated in 1868 to the United States and went directly to the far Midwest, finding work as a clerk in a store in Bernard, Kansas. In 1872 he moved east to Chicago where he entered the liquor business as a traveling salesman. paper hanger and painter in the East, arriving in Chicago 1869. There he continued toiling for several years in the wall paper business with two local firms. Then Hannah and Hogg met and the synergy between the two Scotsmen was electric. 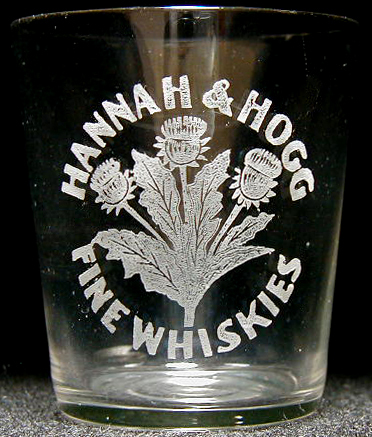 In June 1873 they formed a partnership to run a drinking establishment at 190 Madison Avenue they called “The Thistle.” They soon branched out into the wholesale and retail liquor and cigar trade, calling their operation simply “Hannah and Hogg.” The thistle as shown on several items here, was their enduring trademark. It appeared prominently in their advertising, on their cigar box lids, and on the front of their whiskey jugs. The thistle also was prominent as part of their decor for their “wet goods” stores, opened one by one over the years at a number of Chicago downtown addresses, including 222 S. Clark, 166 and W. Madison, 146 E. Madison, 151 E. Randolph, 112 Monroe and 88 LaSalle Streets. As shown here, each of those Hannah & Hogg outlets also boasted larger than life sized stone statues out front as advertising gimmicks. 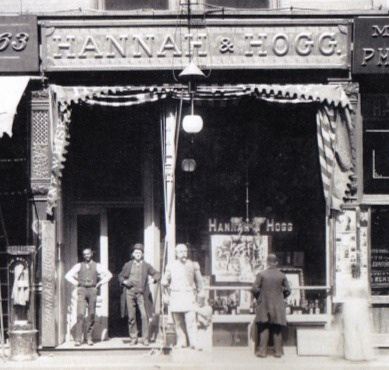 Hannah was president of the company and Hogg vice president. In the years following the creation of their partnership they married sisters. Hannah wed Catherine Grady in 1875 and Hogg married Mary Grady in 1877. The Hannahs had three children; the Hoggs had four. The two families lived within a block of each other on Chicago’s fashionable Oak Street. brands vigorously in Chicago area media. Ramshead, for example, was merchandised as “Perfect Whiskey!” Hannah and Hogg packaged their products in both ceramic jugs and glass bottles and flasks. In the mode of the times, they also offered giveaway items to favored customers, including shot glasses and bar tokens. Predictably, the thistle was present on most Hannah & Hogg gifts. These transplanted Scotsmen were eminently successful and soon became rich and well recognized figures in Chicago. Canny about politics, they covered both bases: Hannah was a prominent Democrat; Hogg an active Republican. Hannah was recorded as a Presbyterian and a Mason. Hogg’s 1905 biography fails to mention any other affiliations. 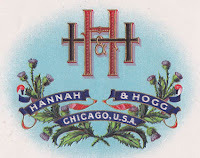 In time Hannah & Hogg came to own and operate the Brevoort Hotel, one of Chicago’s premier hostelries. For the purpose they created a separate corporate entity and located their business offices there. 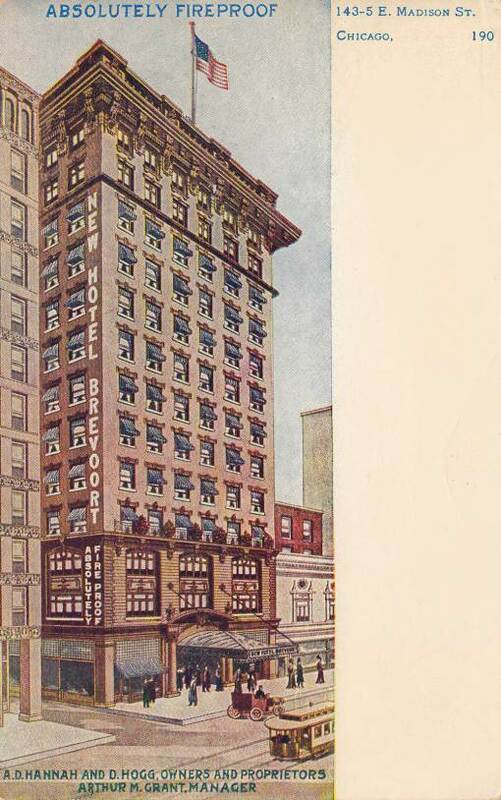 This establishment, located in the city’s Loop District, was built in 1906 and was a landmark at 120 Madison Street. A post card view of the Brevoort emphasized that it was “absolutely fireproof,” clearly a reference back to the great Chicago fire that had burned out much of the city’s downtown. 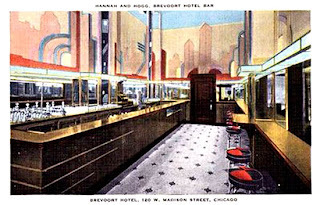 Another postcard shows the highly decorated “art deco” bar in the hotel. It was a major “watering hole” for the city’s elite. The Brevort Hotel was demolished after World War II to make way for a church. Chicago establishments did not prosper by serving up effete drinks like Scotch. Their stapes were beer and “copper stilled Kentucky Bourbon,” wrote Chicago pundit, George Ade. The latter, he said, was drunk straight and with none of “that cheap fluid they put under bridges or use in sprinkling the lawn.” Charles Moll, whose family ran Moll’s Bar at Huston and 134th Streets, remembered Hannah & Hogg. In my interview with him extolled the quality of the company whiskey. So well known was their establishment that the American author, Theodore Dreiser, used it as the backdrop for scenes in his famous 1910 novel, “Sister Carrie.” In the book he described Hannah & Hogg’s as “a gorgeous saloon from a Chicago standpoint” and his novel included its manager as a major character. Although the account was fictional it reportedly was based on an incident in which the Brevoort’s manager had run away to Canada with Dreiser’s sister. The two founders sold their saloon, retail outlets and brand name about 1910. A. D. Hannah retired and died in 1913 at the age of 70. David Hogg continued to run the Brevoort Hotel until 1920, according to records. He died in Chicago in 1934 at the advanced age of 92. Both men, with other family members, are buried in Calvary Cemetery in the Chicago suburb of Evanston, Illinois. Their names on whiskey, however, had a continuing attraction in Chicago region and the Middle West. 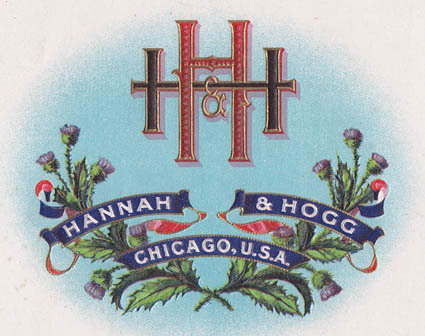 That reputation even survived the 14 years of Prohibition as the Hannah & Hogg label was revived during the 1930s. The Medley Distilling Company of Owensboro, Kentucky, owned the brand. 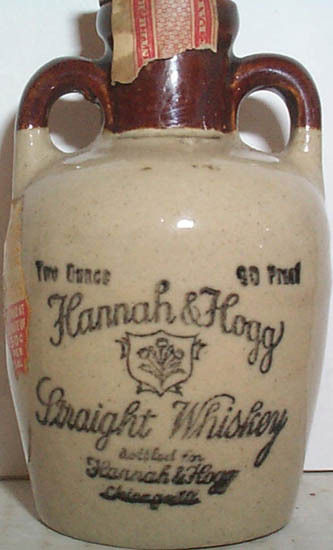 Shown here is one of the two-handled containers in which the Medleys merchandised Hannah & Hogg whiskey. Note that although less emphasized, the partner’s Scottish thistles survived on the jug. It was a fitting reminder of two Scotsmen whose business acumen and talent in the whiskey trade made them rich men and allowed them to plant their thistle insignia all over the Windy City. I'm reading through your blog and love it. I would like to offer one small correction, if I may: The Brevoort Hotel does not, in fact, still stand as a landmark. Or, indeed, as a building; it was demolished in the late 1940s or early 1950s to make way for St. Peter's Church, which opened in a new building on the same site in 1953. Thanks, Michael, for the correction. Glad you like the blog. Sorry to be so late in replying but my former computer crashed about the time you commented and I have been catching up only slowly. 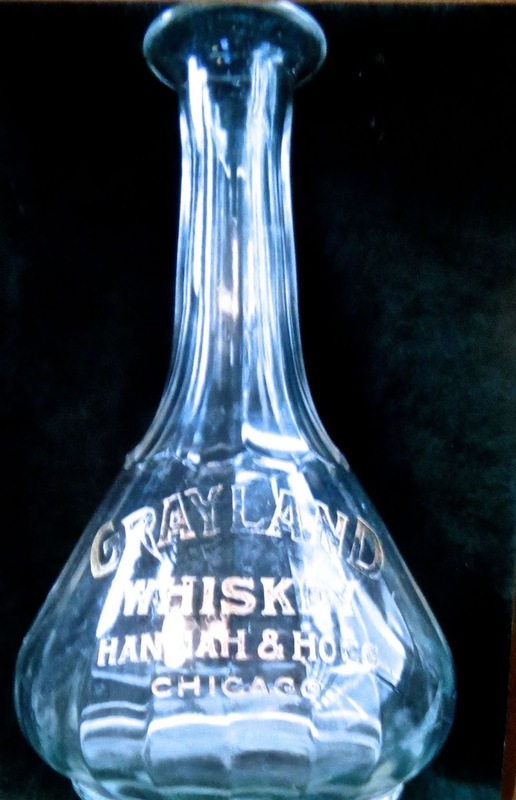 I want to give credit to Wise Wolfe for having sent me a photo of the Grayland back of the bar bottle, shown above. Athough not a bottle collector, he says, Wise is wise on desirable objects and bought this antique for $3. Truly a good find and I am happy to find space for it on this post today.